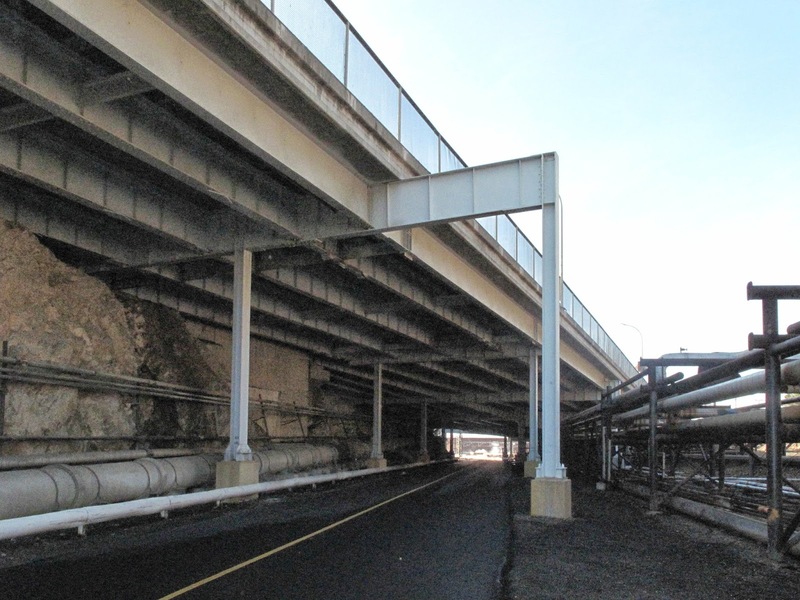 The Scofield Avenue Undercrossing (28 0140L) carries State Route 580 from the east end of the Richmond-San Rafael Bridge over a Chevron refinery. It's an eleven span steel girder bridge supported on skewed steel outrigger bents. The bridge was built in 1956 and retrofitted with restrainers on the steel girder in-span hinge seats in 1988 (see photo below). Even with the restrainers the seat widths look uncomfortably short. This bridge could use another retrofit (or a replacement) but sitting over an refinery makes the whole project a lot more complicated. Contra Costa County, California Bridges: Scofield Avenue UC in Richmond by Mark Yashinsky is licensed under a Creative Commons Attribution-NonCommercial-NoDerivatives 4.0 International License.